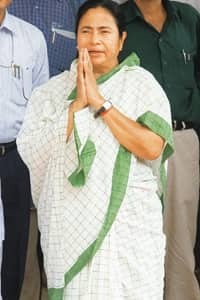 Kolkata: Trinamool Congress leader Mamata Banerjee was at the head of violent protests against forcible land acquisition by the West Bengal government for Tata Motors Ltd’s small car factory in Singur that eventually forced the company to decide to locate the plant elsewhere—at the other end of the country, in Sanand, Gujarat. Now, Banerjee, railway minister in the United Progressive Alliance government—she became that after this year’s parliamentary elections; Tata Motors decided to relocate the plant last year —will decide on the fate of the land acquired for the project. West Bengal’s chief secretary Asok Mohan Chakrabarti said the state government had on Monday written to S.S. Khurana, chairman of the Railway Board, offering the land, some 900 acres of it. “The rail minister had said a coach manufacturing factory could be built in Singur… We have asked for a detailed proposal," he added. Almost three years ago, the state government had leased 645.67 acres to Tata Motors and later some 255 acres more to component manufacturers. Almost 100 acres was retained by the state government for building civic infrastructure. Tata Group chairman Ratan N. Tata said in September his company would return the land if compensated for the “sunk cost". The car maker had almost finished building its factory in Singur when in October last year it decided to abandon the project. Though the company refused to disclose the “sunk cost", officials of West Bengal Industrial Development Corp. Ltd, which acquired the land for Tata Motors, estimate it at Rs300-500 crore. The state government has previously said that anyone who wants to use this land should compensate Tata Motors. A spokesperson for Tata Motors, which still has possession of the land, said: “We have said before, and we are saying it again that we would discuss with the state government all matters relating to the Singur plot." “Whether it’s us (the state government) or the railways, it’s the same thing—there’ll be a factory in Singur," Nirupam Sen, West Bengal’s commerce and industries minister, told Mint. “We have always preferred investments from the public sector. So we had approached Bhel (Bharat Heavy Electricals Ltd) to consider a project in Singur." The state government and Bhel had jointly explored the possibility of setting up a power plant, but the latter said it wasn’t viable. The Banerjee-led Trinamool Congress wanted the state government to return at least 300 acres of land to farmers who refused to sell land for the small car project but Tata Motors said it was impossible to build the plant unless it and its component makers had the entire 900-acre plot. The Trinamool Congress refused to budge, and Tata Motors moved its small car factory to Sanand. Meanwhile, 2,156 farmers have not accepted cheques from the state government to protest the land acquisition, according to Abdur Rezzak Mollah, the state’s land and land reforms minister. They collectively own 243.66 acres of land, he added. “Such is the strength of the opposition now that no industrial project is possible in Singur unless at least 250 acres of land is returned to farmers who haven’t yet accepted payment on protest," said a state government official, who did not want to be named. But returning the land would not have been easy because it would have led to a lot of legal complications, according to this official. “With one masterstroke the state government has divested itself of all complexities of returning the land... It’s now Mamata Banerjee’s headache," he added. The state government has said in its letter to the Railway Board that it is “agreeable to hand over the entire land (900 acres) at Singur to the railways". A spokesperson for the Railway Board said the railways was interested in the project if it could get Tata to vacate the land. “It is an intelligent move," said Manoj Bhattacharya, a leader of the Revolutionary Socialist Party—an ally of the ruling Communist Party of India (Marxist)—and a member of the Rajya Sabha. “I can’t say immediately whether the Left Front will politically benefit from this decision, but it should surely benefit the people of Singur." “It is an intelligently-worded letter, which keeps the terms and conditions of the offer vague," said Partha Chattopadhyay, a Trinamool Congress legislator and the leader of the opposition in the state assembly. “Our party is firm in its view that 400 acres of land should be returned to farmers." West Bengal goes to the polls in 2011.